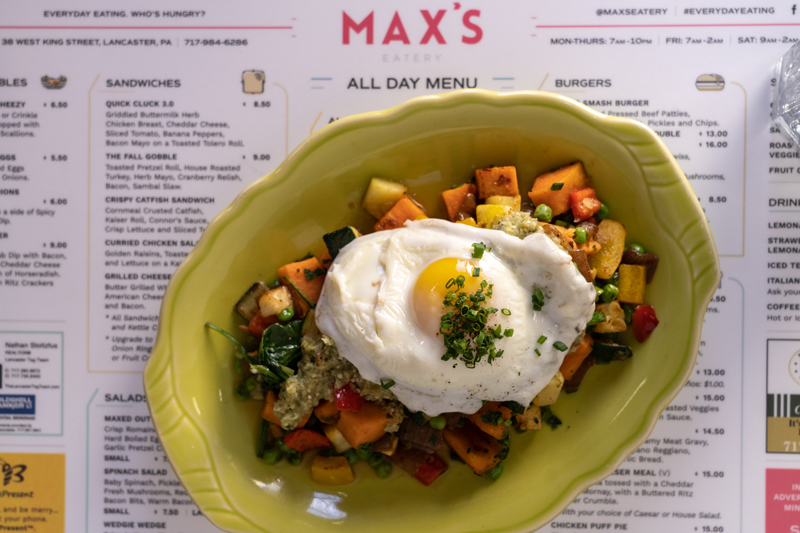 The motto of Max’s Eatery is “everyday eating.” It lives up to that promise, offering “adventurous food” at affordable prices with a dash of fun and “beloved memories” thrown in for good measure. 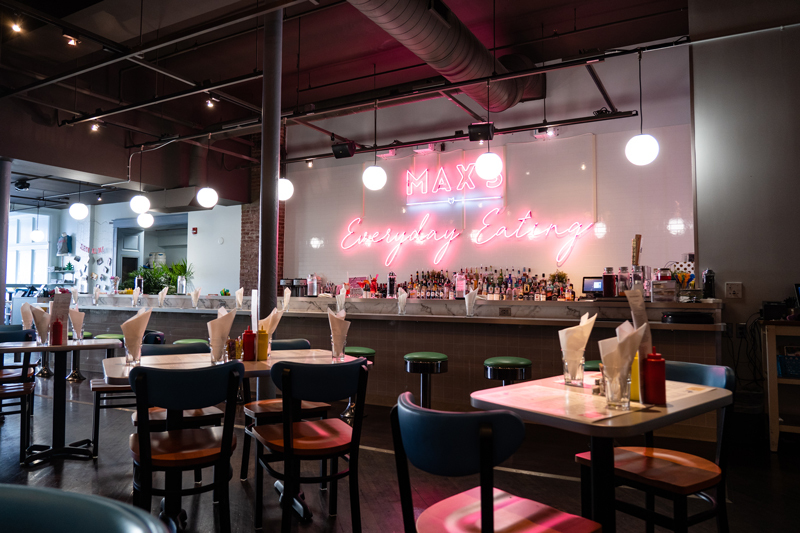 Located in downtown Lancaster’s market/theatre district, Max’s held its grand opening in September. Megan Lefever Titter manages the front of the house, while Chef Matt Titter oversees the kitchen. 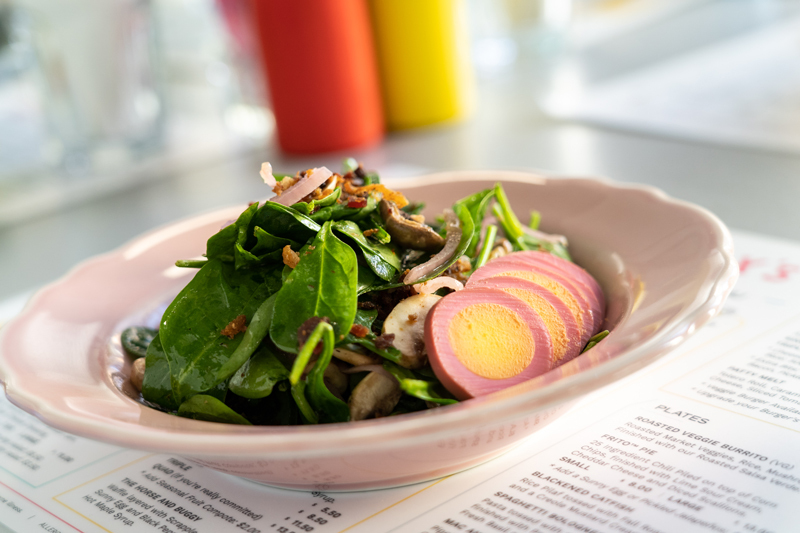 The restaurant is a collaboration between partners Douglas Bernard, Connor Harris and Chef Matt Titter. Megan Lefever Titter, who is a certified sommelier, serves as front-of-the-house manager. 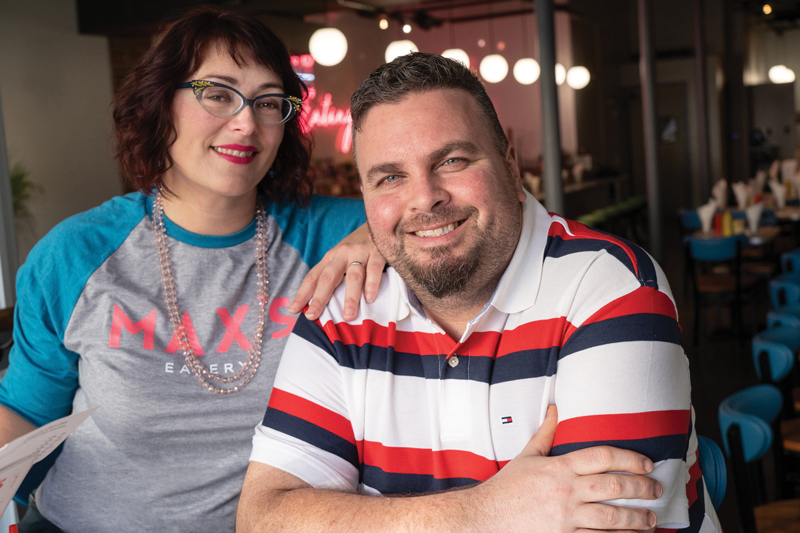 Named after Matt and Megan’s 9-year-old son, Max, the eatery fills a niche in the downtown restaurant scene. The interior, which is characterized by exposed brick and high ceilings, offers seating for about 115, including tables in the two storefront windows that flank the doorway. A counter features seating on soda fountain-style barstools. The restaurant’s name and motto are emblazoned in neon pink behind the counter/bar. Matt says the counter styling was inspired by sushi counters, which traditionally have two tiers. “We deliberately designed the counter to be two-tiered rather than a flat bar top,” Matt notes. Also, by design, there are no TVs. “We want to encourage couples, families and friends to interact with one another rather than focusing on a TV,” she stresses. 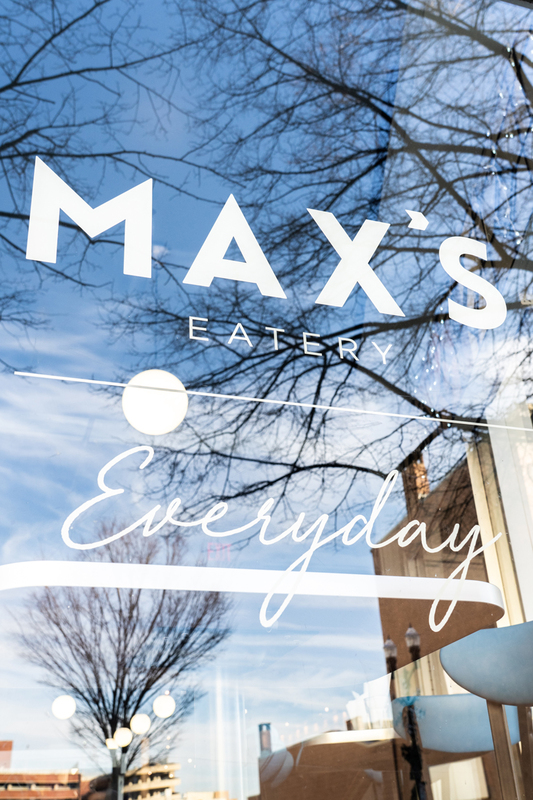 Max’s offers an “all-day” menu. 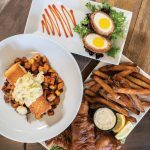 “Breakfast meetings are popular downtown, so we offer breakfast items. 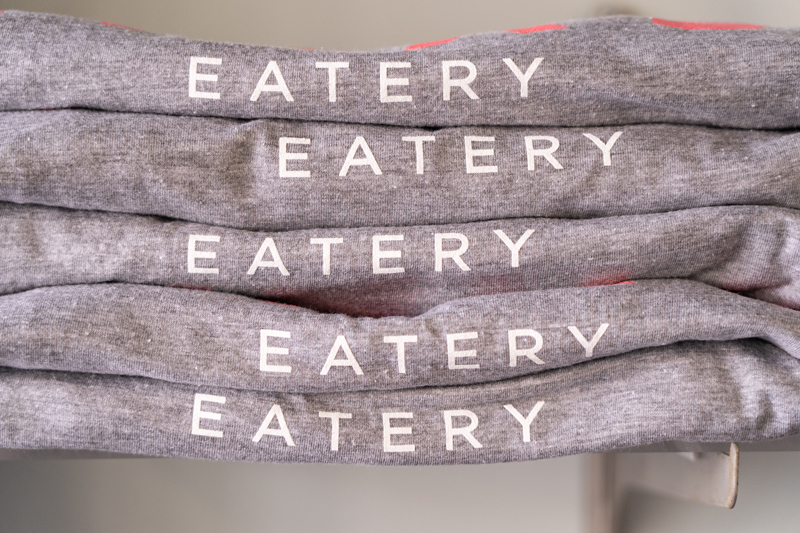 But we’re also an everyday eatery, so we want someone coming home from third shift to be able to order breakfast, a sandwich or an entrée,” Megan says. Matt says the menu will change two to three items annually as seasonal items are added. For example, the recent “Sweater Weather” menu included a Fall Gobble sandwich – house-roasted turkey, herb mayo, cranberry relish, bacon and sambal slaw on a toasted pretzel roll. 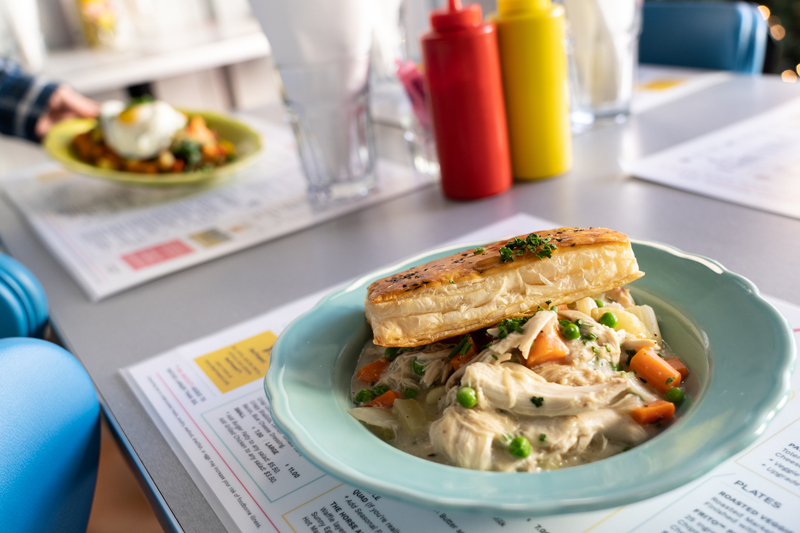 The menu also features sweet potato hash, roasted veggie burrito, burgers, chicken puff pie, spaghetti Bolognese, a Caesar salad, and hot popper crab dip. For those on the go or for family dining, there’s a cereal bar. All of the bartenders are also trained soda jerks. “We do have a full bar, but we also offer both JV shakes and floats without alcohol as well as adult shakes and floats,” Megan explains. 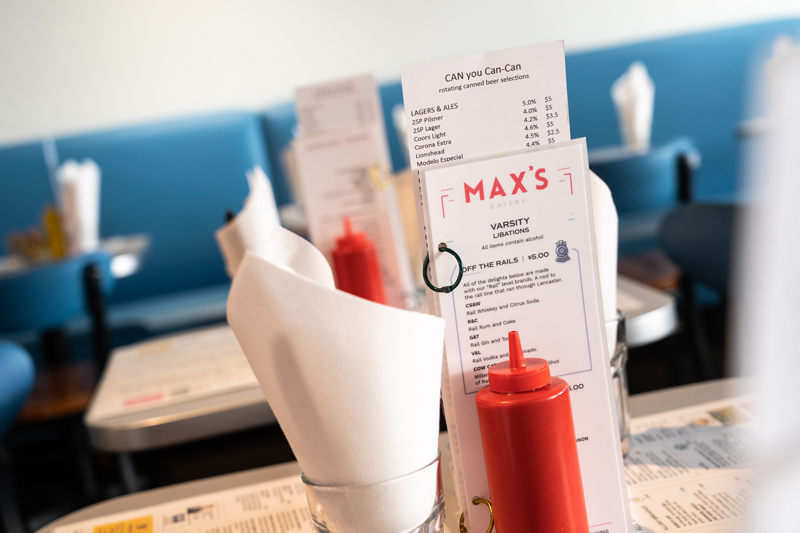 Staff engagement is part of the fun – in fact, Max himself can sometimes be found at the restaurant after school or during school vacations. 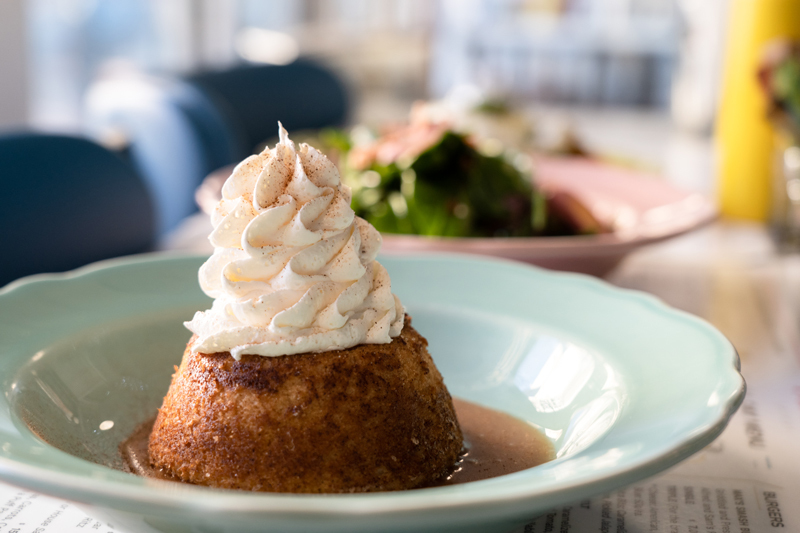 If it’s a guest’s birthday, they not only receive a special treat (a waffle with whipped cream and a candle), but also a serenade from the staff. “We really love birthdays,” Megan says with a smile. 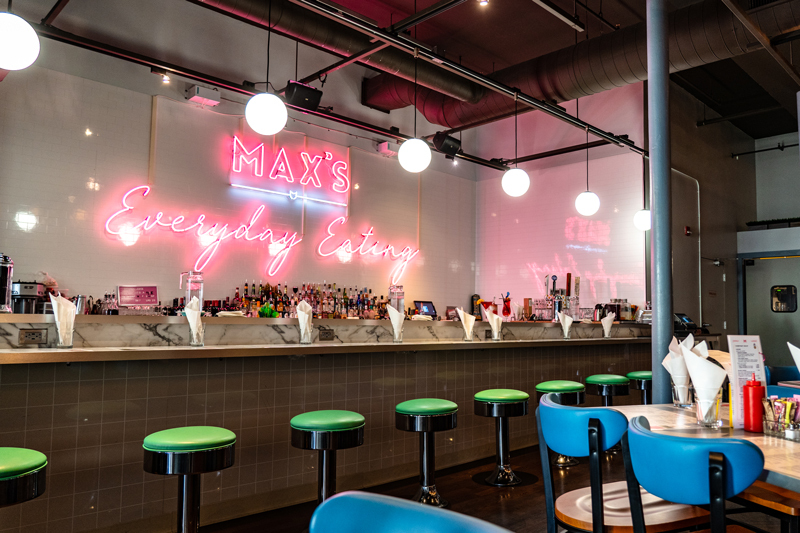 Max’s also hosts a monthly Sunday Supper that’s theme-based. 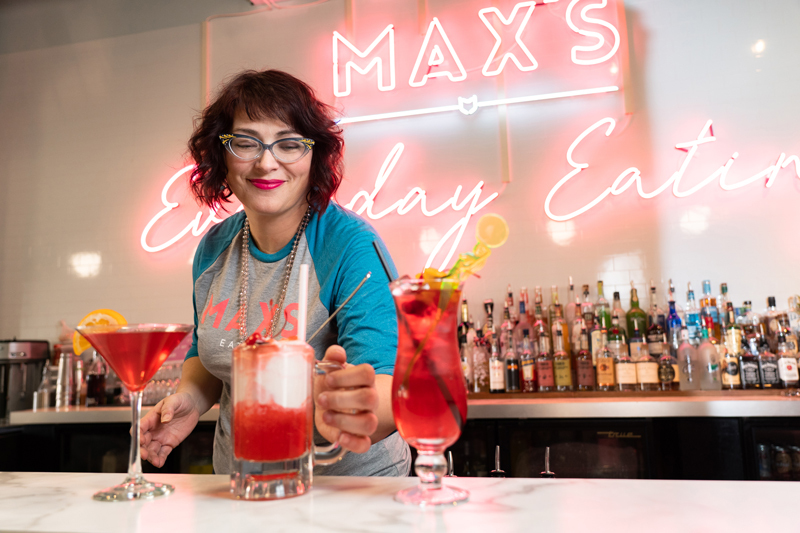 According to Megan, the themes vary and have included the Great Maxby – a nod to the flapper and speakeasy era – where staff and many of the guests dressed in period costumes. 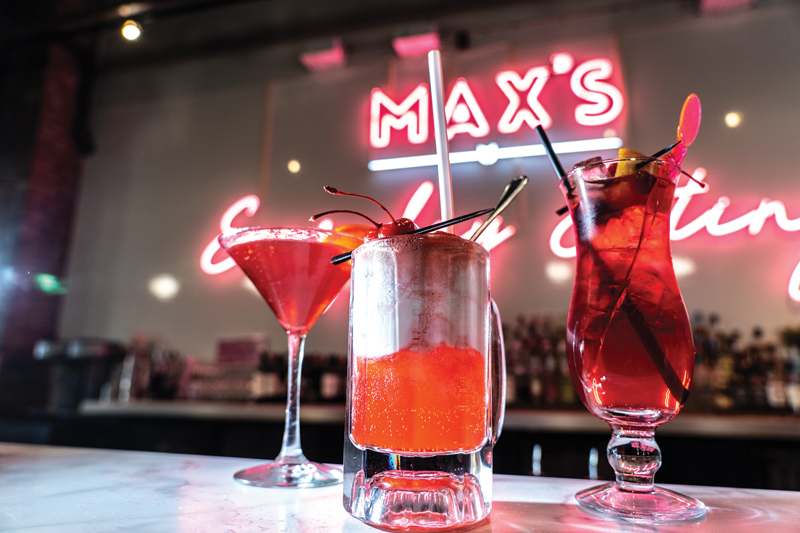 For the upcoming Galentine’s Day (February 13), Max’s will have a special float as well as a few other features. “It will be a fun time,” Megan says. What is Galentine’s Day? The comedy series Parks and Recreation receives credit for this pop culture-inspired holiday. In the February 11, 2010, episode of the NBC series, Amy Pohler’s character, Leslie Knope, referenced her annual Galentine’s Day party, explaining to castmates and the audience that “every February 13, my lady friends and I leave our husbands and boyfriends at home, and we just go out and kick it, breakfast style.” The episode inspired Galentine’s Day celebrations nationwide. 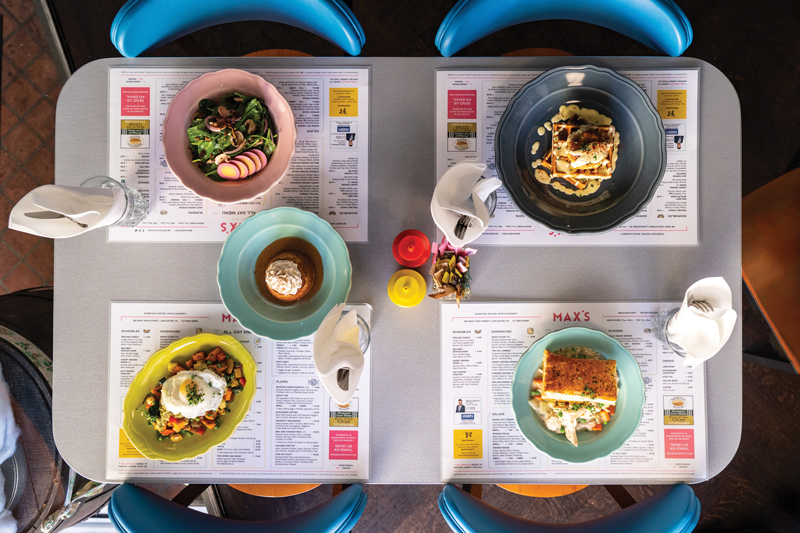 Breakfast has since expanded to include brunch, lunch and dinner. Parties are held in which women celebrate their friendships. 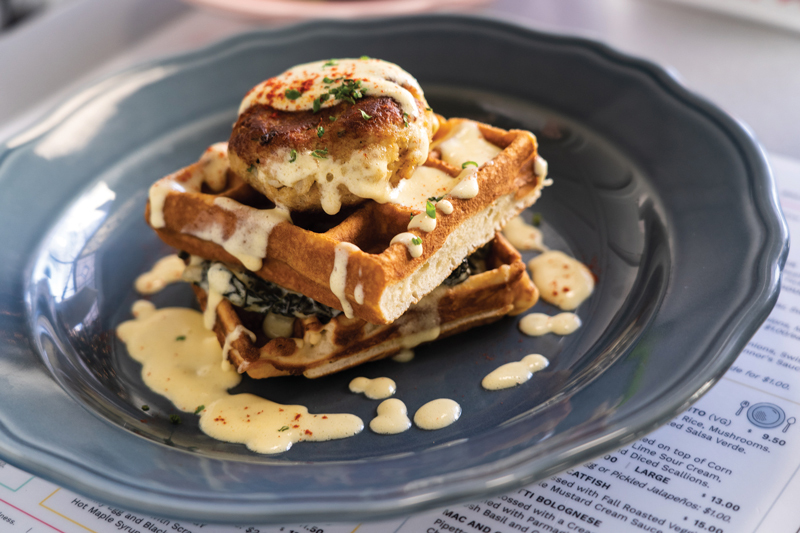 As a result, on February 13, many waffles (the official food of Galentine’s Day) are eaten, mimosas imbibed and gifts exchanged. 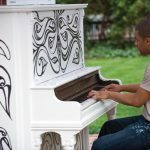 Restaurants, florists, spas and salons, greeting card companies and retailers have jumped on the bandwagon. Max’s Eatery is located at 38 W. King St. 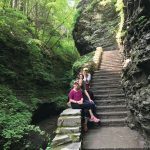 Hours are Monday-Thursday, 7 a.m.-10 p.m.; Friday, 7 a.m.-2 a.m.; Saturday, 9 a.m.-to 2 a.m.; and Sunday, 9 a.m.-7 p.m. Reservations can be made online. Takeout available. Delivery available via Uber Eats. For more information, call 717-984-6286 or visit maxseatery.com and on Facebook.